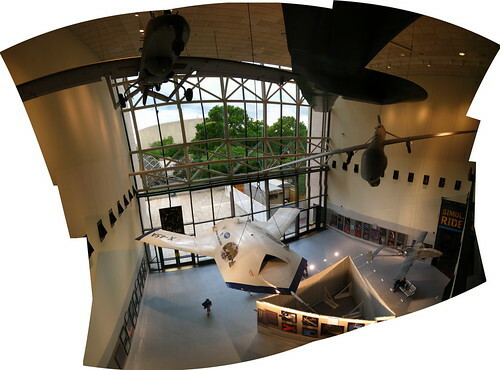 UAV exhibit at Air and Space. I stitched this panorama from a 3×4 matrix of photos from the second floor, leaving ragged borders uncropped to keep the full range of view. Visible here: RQ-7A Shadow 200, RQ-3A DarkStar, MQ-1L Predator, X-45A J-UCAS, and RQ-2A Pioneer. Larger image, and official NASM press release.